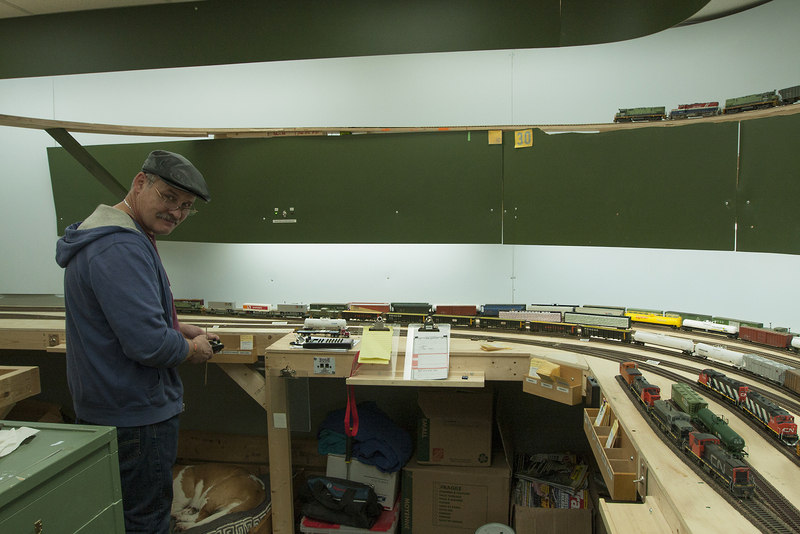 October 13 2015 marked the very first official operating session on the layout. Friends AJ, Dave, Jack, Ken and Doug from our regular operating group put the layout through its paces for a few hours. I’m pleased to say everything worked close to plan, and there were a few learnings taken from the session. 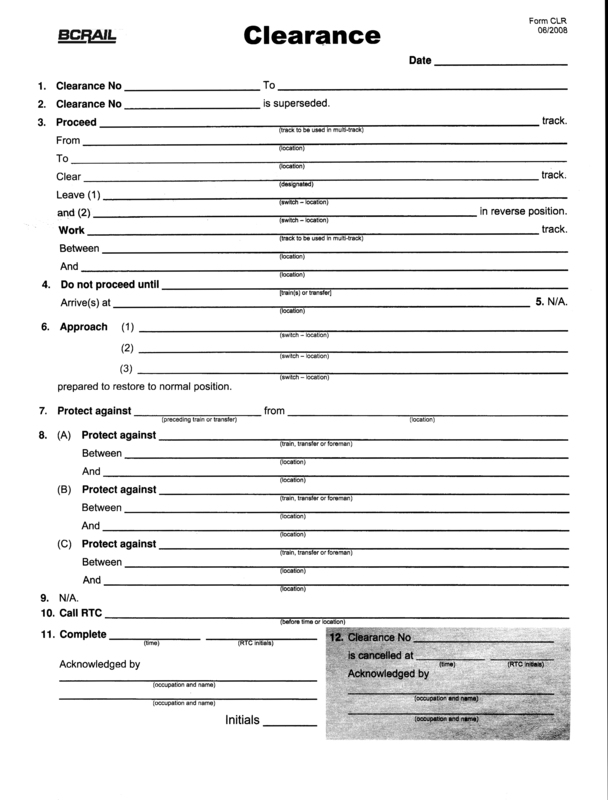 I’ve purchased some FRS radios and have printed out a basic OCS clearance form template to be used in the next session, once I clean out a spot in the furnace room for the dispatcher to sit! AJ runs a north bound freight at Pinesul while Jack waits in the siding with the local. Ken does a pretty good job of filling the yard at Chetwynd with cars. By the end of the session he managed to sort everything out! 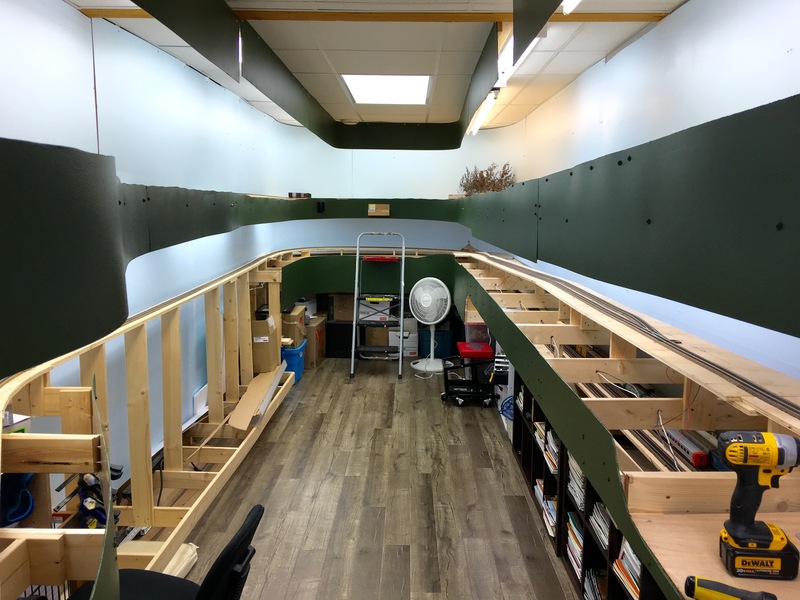 When I started to plan the new layout, semi prototypical operation was a key design element. For several years now, I’ve been involved in a local round robin group of very talented modellers. 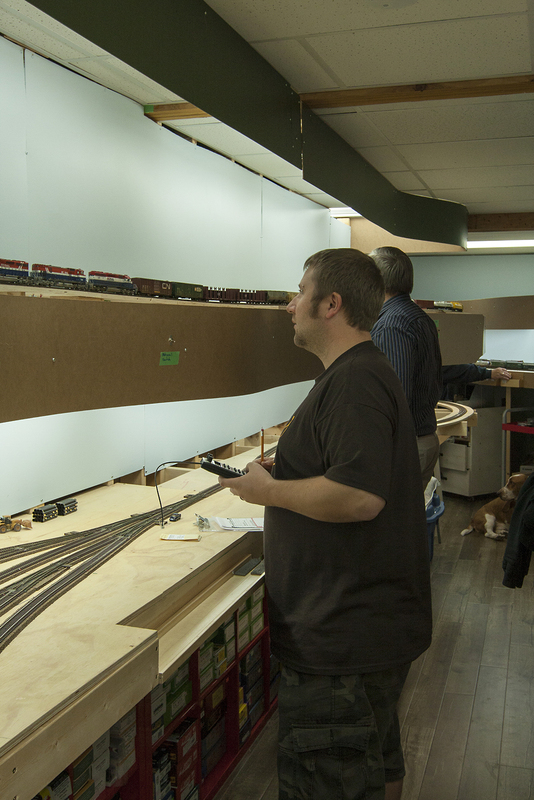 Each week (or so) we meet at someone’s house to operate their layout, work on projects, or usually kill the evening with a lot of BS. 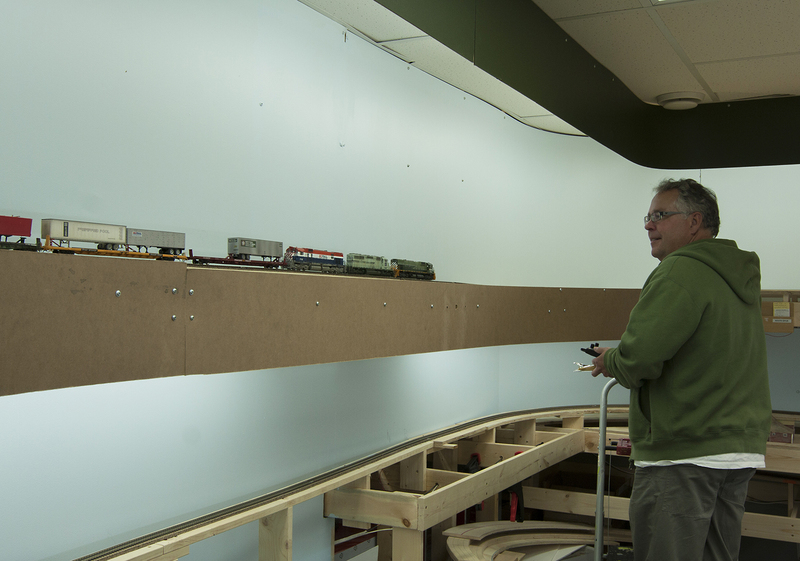 I really like operating sessions on scale model railroads. Rather than run a train endlessly around a layout, you get a chance to run it like the real railroad would. 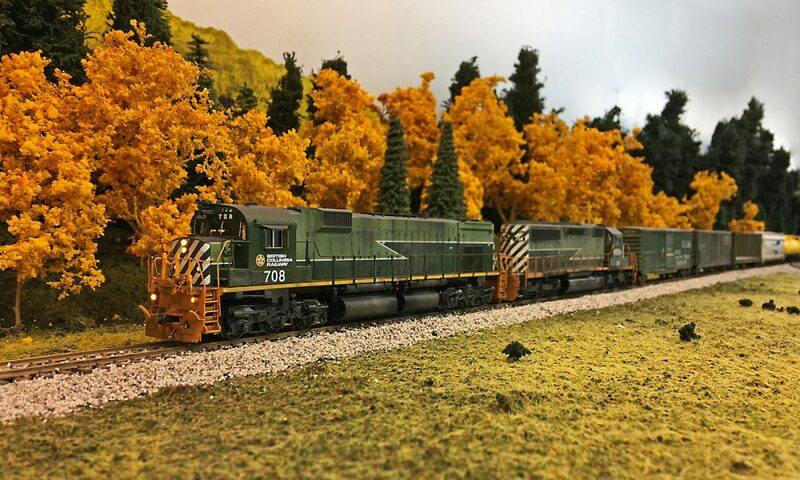 Of course, as model railroaders we keep on finding reasons to make more switching moves, whereas the real railways try to get things done in the least amount of moves. 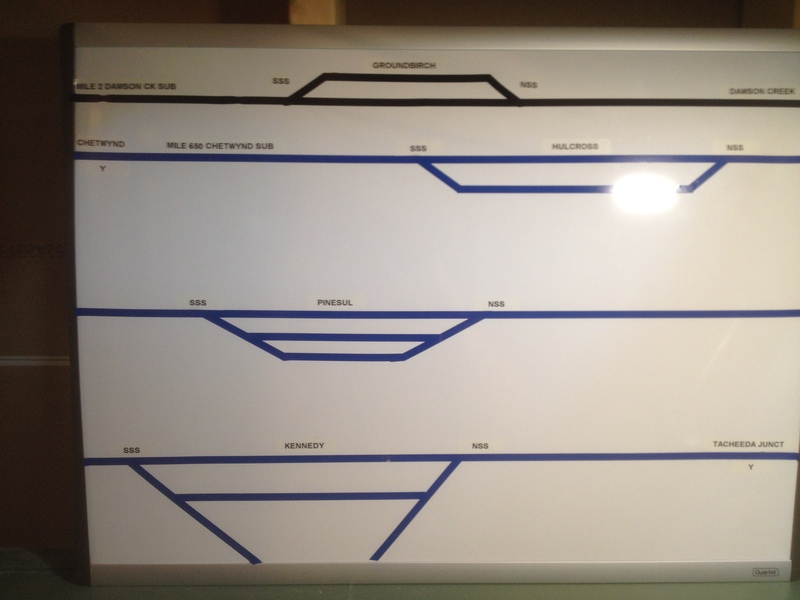 I’ve operated with car cards, and switch lists, and plan to use both on the new layout. Dawson Creek Wayfreight: Runs from Chetwynd to Dawson Creek and return. Power restricted to 4 axle M420, C425, and RS-18 locos. Max train length 10 cars, 3 units and a caboose. Dawson Creek on the old layout was a pretty good switching puzzle (as is the prototype). The new layout will essentially have the same track layout. Traffic is cars to the Louisiana Pacific OSB mill, TOFC, station track, 3 grain elevators as well as the CN interchange. Pinsul Local: Runs from Chetwynd to Pinsul (located o nthe upper level) Switches the Pinsul sulphur load out and runs back to Chetwynd. Power 2 units, 6 cars and a caboose. The prototype in my time period quit running the local and had the regular freights witch Pinsul, however I wanted to keep the local job. In addition to switching Pinsul, the local may be required to run to other locations to lift bad order cars dropped by other freights. Helpers/ Locotrol Operation: This job was created after one of my friends asked if I would need helpers up the helix. The trains that run up the helix should be sufficiently powered, but I liked the idea of a helper job. The helpers will consist of a 2 unit high horsepower set (C/M630 and or SD40-2) and will push trains from Chetwynd up to the siding at Mackenzie. I don’t have room to model the branch line to Mackenzie, but I will have a dummy wye and maybe a short siding on the upper level. The helpers will use one leg of the dummy wye to cut out of the train, then return light to Chetwynd. For sessions where I don’t have a helper crew, all south bound (lower to upper level) freights with the exception of the Pinsul Local will have Locotrol slave units cut into the train. Prince George Ft St John Freight: (or PGFSJ) Runs from Prince George staging on the upper level to Fort St. John staging on the lower sub level. Job will drop Dawson Creek/Chetwynd cars in the yard at Chetwynd, list FSJ traffic, then run to the FSJ staging yard located under the Chetwynd yard. Power 2 to 3 units, 20 cars or so and a caboose. Prince George Chetwynd Freight: Runs from PG staging on upper level to Chetwynd yard on lower level. Freight terminates at Chetwynd. In addition to the scheduled jobs, I plan on running work and passenger extras when required. Typically I’d like the layout to run with 3 to 4 operators, but I can add or remove jobs based on the number of people that show up.